I am not certain if this Body Shop product has already landed in Manila. I know the Dragon Fruit Lip Butter has been introduced. 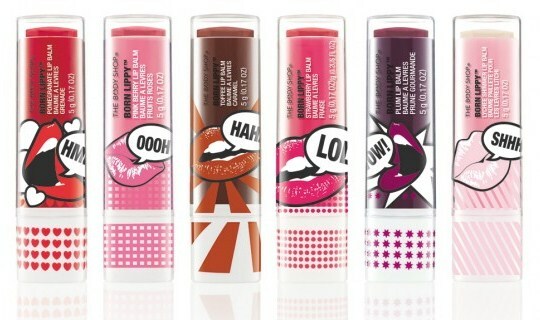 But I want to share these really cute Body Shop Born Lippy Sticks which I bought as gifts for my girl friends. They are the same Body Shop Born Lippy gloss in pots, or maybe not? I found them in the Body Shop Store in Lundy's Lane Outlet Shop in Niagara Falls. Click Read More for the review.. I find it really hard to buy nice and affordable items as gifts (pasalubong). My guy friend bought a lot of stuff from Body Shop from Shopper's Bag ($6 CAD), make-up bag ($4 CAD) to gift sets (less than $20 CAD for perfume and lotion gift set!). The packaging of the Born Lippy Sticks got me! I am sucker for really cute packing! Although I always prefer balms/glosses in pots, I thought these would make really cute gifts for the girls. Each costs $6 CAD (plus taxes it might total to $8). The package that I bought is really a good deal. From $24, it is now at $14.40 for 4 Born Lippy Sticks! I haven't personally tried it because I intentionally bought these as gifts, but I asked my friendly friends to give their verdict. "the one in pot is more "oily" compared to the stick. The pot moisturizes more than the stick but it moisturizes good compared to other brands'"
".. the scent is yummy, and I tend to lick my lips more often!" ".. it gives a good shine and tint to the lips"
I think what is good about this innovative product, is that there is no need to dip the finger to use it! Even without mirror, you can swipe the tube in your lips, and pout! Here is the complete Body Shop Born Lippy Sticks collection..
Have you tried the Body Shop Born Lippy Stick? Will you buy it?